Welcome to the Website of the 333rd Toronto Venturer Company! Find out about our meeting time and schedule. There are various events and activities that the company participates and conducts throught the year. The Event Schedule has recently been updated on June 2nd. Please check it out to see what's happening. We went to Ireland !!! Summer 2007. We had an amazing time with great Irish hospitality. Check out some of the pictures from our trip, or see what exciting activities we had in our itinerary. 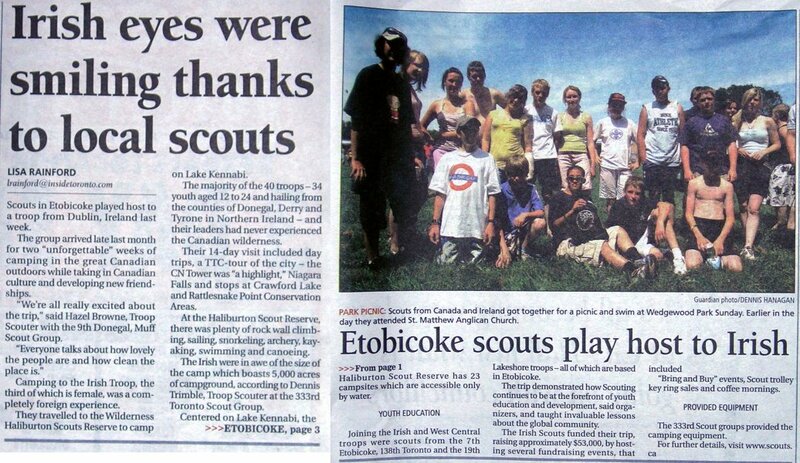 Check out this article from The Guardian, a local Etobicoke newspaper about the Irish group's visit last year! This page is the property of the 333rd Toronto Venturer Group. Originately created and designed by Nevin and updated and maintained by Keegan.